Ivo Van Hove likes to deconstruct texts onstage, putting his stamp on other people’s ideas. This typically means that a 2-hour play will run 3 or even 4 hours because of the extra bulk. The “stamps” don’t necessarily add anything, but may rather detract from the original piece. 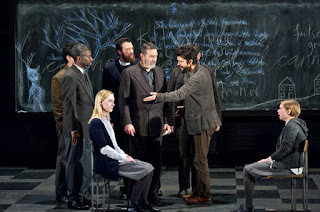 For instance, in his current version of Arthur Miller’s The Crucible playing at the Walter Kerr Theatre, he adds “supernatural” effects. If you know Mr. Miller’s play ,or American history, you know the girls in Salem never saw a witch or a spirit. A group of adolescent girls in Salem were trying to get themselves out of trouble for getting caught dancing in the woods in the dead of night — dancing at any time was forbidden in their culture — by pointing accusatory fingers at others. If you don’t immediately understand (and it was quite clear in this production) that the girls were lying, you must have nodded off halfway through the first act. 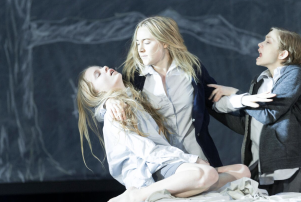 So when Mr. Van Hove adds interludes of a girl levitating and the wrath of God in the way of a lightning storm with high winds blowing singed paper into the schoolroom as if there’d been an explosion in the next county, he confuses the issue. He creates a lie on top of the lie that does not help get the point across. At least not the point of Arthur Miller’s play. He gives an excuse to the adults who go along with the girls and their lies and the hell they create in Salem village. And there is no excuse for the actions of the “righteous” adults in Salem in The Crucible. First Van Hove brings the action forward to a more modern time. The classroom the curtain rises on had a generic bland look, the hard chairs occupied by girls in their 'tweens and teens. They wore conservative private school pleated skirts, knee-highs and white blouses. Modern and neat. The scene designed by Jan Versweyveld is open and light, with a large blackboard at the back of the stage covered in drawings and occasionally words. The greatest flaw to this scenic design is its freedom. There is no ceiling, and the walls reach out to the edges of the stage. It’s wide open and bright. Salem was neither bright nor open. 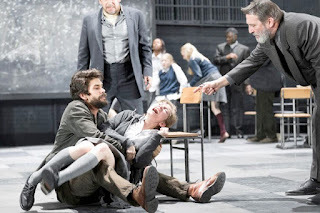 Just as importantly, Mr. Van Hove’s loosey goosey staging uses all the corners of the set, so the audience sitting house left or right cannot see what goes on there. I’ve written about this issue in the past, when directors ignore the audience viewpoint by staging action where only those who can afford front and center can see it. This is the responsibility of the director along with his designer. This problem would not have arisen had Mr. Van Hove 1) considered the claustrophobic society that trapped his characters and 2) walked the auditorium to see what parts of his staging needed to be adjusted to the theatre. Not everyone sits orchestra center. 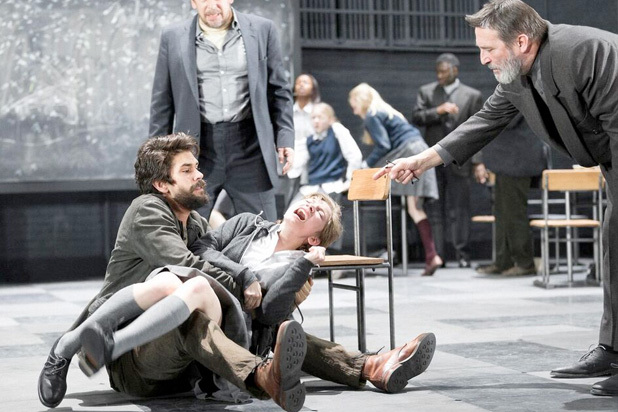 The action starts on that banal classroom disrupted, desks and chairs overturned — perhaps to give the actors something to do later. Van Hove (with his costume designer Wojciech Dziedzic) makes the Reverend Parris look like a modern Jesuit in a sloppy sweater. The adult women wear something like loose gaucho pants with baggy tops, the men somewhat deconstructed business suits. Once the play begins, the girls’ white blouses come untucked. Hardly fitting for an overly restrictive society. Abigail vs. Mary in the foreground surrounded by, L to R, Hathorne, Parris, Danforth, Proctor. Jason Butler Harner as Reverend Samuel Parris did fine work, showing us the preacher’s desires for monetary recompense and the respect he believes should come with his position, revealing him to be an articulate but weak man. It is impossible to trust that he ever truly believed the girls, but maybe that’s as it should be. Tina Benko does her job as Ann Putnam, but still doesn’t make that hard-hearted character come to life, any more than Thomas Jay Ryan does for her husband Thomas Putnam. Brenda Wehle does not embody Rebecca Nurse when she enters, seeming to rely too much on her age to appear a village elder. She does not reflect the strength of character Goody Nurse has that makes the whole village respect her. Everything was rather dreary and stiff in not-old Salem with not-old-fashioned people speaking Mr. Miller’s lines intended for 17th century characters, until Ben Whishaw entered the playing space. He cast the perfectly competent Mr Harner into the shade. 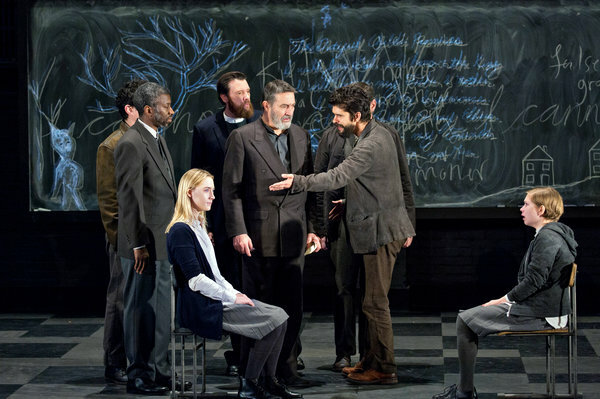 Whishaw, while not physically imposing, took over the stage and the theatre, with his dark voice and straightforward talk. 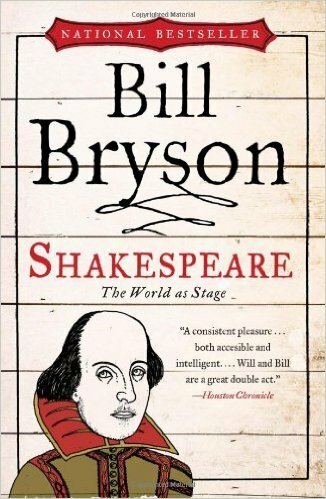 He embodied John Proctor, the voice of reason from an imperfect man in a world gone mad. For the rest of the play, we only wait for him to return to the stage. He did have a rather unfortunate habit of jumping on people, which became distracting in his penultimate scenes. I get it. I just don’t think it worked. The greatest disappointment of this production was Saoirse Ronan, whose film work I quite like. As Abigail Williams, the teenaged seductress, she was shrill, stiff, “johnny one note” throughout. She clearly had no vocal training or prior stage experience, which is unfortunate if her film experience led her to believe all would be fixed in the editing room. It’s easy to see why the other girls fear her, hard to see why anyone would feel “softly” toward her. As for the other girls: Jenny Jules’ turn as Tituba, the Reverend Parris’ slave from Barbados, is grounded and appropriately amusing until threatened into submission. Elizabeth Teeter as Betty Parris has fine powers of concentration as she’s mauled about while “sleeping,” Ashlei Sharpe Chestnut as Susanna and Erin Wilhelmi as Mercy Lewis were barely noticeable. Standout here was Tavi Gevinson as Mary Warren. Initially Ms. Gevinson rather annoyed me as she seemed to be attempting to channel Scarlett Johansson. By the second half, though, she’d gathered her strength and wits and did fine work as the torn participant in the travesty that was the Salem witch trials, suffering through her dilemma: To be a part of the in crowd and do evil is one thing. To step outside of that crowd and do good is dangerous. Jim Norton played the litigious Giles Corey with heart and humor. It was easy to believe this man was a friend of many in his community, making that community’s betrayal and murder of him and his wife all the more appalling. The revered Reverend Hale entered Salem full of pomp and confidence and left broken. His blind arrogance had a great deal to do with the growth of this ridiculous story told by guilty children into an all-consuming monster. Bill Camp was competent enough in the role but neither deep nor varied. By the time we met Francis Church, his wife Rebecca was already falsely imprisoned so Ray Anthony Thomas had only the opportunity to plead for justice for his wife, his friends, and himself. His performance was on the mark for the scene that leads its hearers to assume the play is really about the McCarthy hearings and naming names. This is echoed at the end of the play by John Proctor when he retracts his false confession because his name is all he has left. Nicely done, Mr. Miller and Mr. Thomas. Sophie Okonedo was rather dull as Elizabeth Proctor offering us none of the character’s layers. I expected more of Ms. Okonedo. 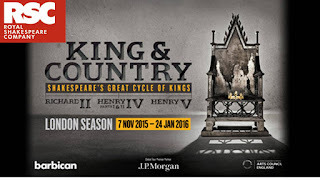 Ben Whishaw as John Proctor with Tavi Gevinson as Mary Warren, and Ciarán Hinds as Deputy Governor Danforth.. I looked forward to the entrance of Ciarán Hinds as Deputy Governor Danforth in the second act, and was not disappointed. Mr. Hinds can command a stage and every other person on it as if he were born to that power. His embodiment of Danforth assured us that the real Danforth is still burning in hell. The only fault was that he seemed too intelligent to be so easily taken in by Abigail Williams, especially Ms. Ronan’s Abigail. Teagle F. Bougere as Judge Hathorne postured and recited lines, as did Michael Braun as Ezekiel Cheever. Those characters had beliefs and flaws, but these actors did not seem to know it. Philip Glass music underscores the story, rarely overpowering it. Favorite scene (that Mr. Miller did not write) gave us a wolf examining the stage. A nifty scare. Two final points about Mr. Van Hove’s direction. First, the staging was clumsy, the playing space overlarge. Bring the set in a little tighter or don’t stage scenes in the far corners. Finally, I must wonder: Are the dull performances of some of the secondary and tertiary characters the fault of the actors or the director? Does Mr. Van Hove prefer the characters who are not primaries to fade into the background like chairs? Does he not bother to work with those actors to develop their performances? If all his focus was on Ms. Ronan, he surely failed. Somehow despite the three hours it took Mr. Van Hove to tell this tale, his production did not tell the story of the play. It is an important story and always relevant, and this lost opportunity is a shame. In short, I prefer Mr. Miller’s version of his play to that of Mr. Van Hove. ~ Molly Matera, signing off to re-read a play I first read when I was 12 years old. Full disclosure: Decades ago, I played Abigail Williams in a touring production of the play with far fewer actors and a portable set. It was one of the joys of my life as well as an extraordinary education. Maybe it’s better to not have as big a budget as Mr. Van Hove clearly had. Kudos to the imaginative director of that past traveling production, Eric Hoffmann. And R.I.P. to its fine Reverend Parris, the late Michael Graves.